Alphabet Buys YNoFace for $4.5 Trillion. Not! An artist with a unique sense of humor, fertile imagination, and or an ironic way of looking at the world, claimed he became the richest man in the world when Google’s parent company, Alphabet, bought his art business in exchange for stock. Antonio Lee, owner of YNoFace Holdings, is a 32-year-old painter who works in acrylics, filed a report with the Securities and Exchange Commission falsely claiming that Alphabet gave him 4.5 billion Class A shares in its company as payment for YNoFace Holdings. That number of shares is about a factor of ten larger than the actual number of outstanding shares, and would be worth an estimated $3.6 trillion, making Lee richer than Bill Gates, Warren Buffet, and Jeff Bezos, all together! The false filing seems to have done little damage other than to Lee’s credibility, although it has gotten him so free publicity. There is no evidence that anyone believed his filing claim, that he profited in any way, or fooled any investor. The former barber and retail agent, who paints his subjects without faces, told the Chicago Tribune that he always wanted to be rich, “so I could have more free time with my family.” He is a divorced father of three. The filing did make its way into the SEC’s Edgar database, which takes online submissions of regulatory filings. Every year as many as 800,000 forms are filed with the SEC, or an astounding 3,000 every working day. The government does not check the filings, and frequently doesn’t even remove the ones found to be false. The government can choose to charge false filers with a civil-fraud lawsuit, or even a federal criminal prosecution can ensue. This was not the first-time Lee filed a false form with the SEC. On October 19 Lee said that the Bank of America bought a share in YNoFace Holdings for the company’s stock worth $88 billion. Apparently, he was still not rich enough. And the winner was: The Art Institute of Chicago for its digital tool called JourneyMaker in the Visual Media Experience division. The tool allows families to create their own personalized tour of the Art Institute museum ahead of time, to make their “in-person” visit more rewarding. The yearly Interactive Innovation Awards entered its 20th year at this year’s SXSW conference, and gave out a total of 13 awards. The awards cover a wide range of categories, including wearable tech, VR & AR, smart cities and new economy. JourneyMaker was launched last year. Users create a personalized tour of the museum choosing one of eight storylines, like Superheroes or Time Travelers. They then select the works found in the museum that they would like to visit that fit within their chosen theme. When you are done, you can even print a hard copy of the guide you just created, and come well-prepared for some great museum fun. The main goal of the tool is to make what otherwise could be a daunting, confusing experience at the museum into an organized, enjoyable journey which the whole family planned together in advance. Midway Airport-Chicago. Photo by Vmzp85. 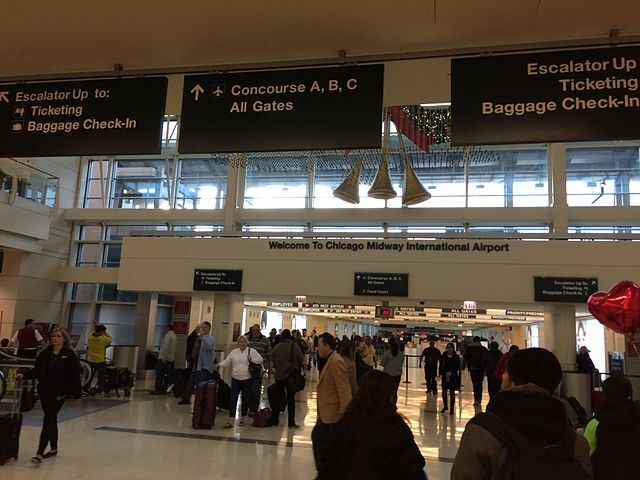 On Chicago’s southwest side there is a lesser known airport known as Midway International Airport, that is about to play a game called catch-up. Last month the city finalized a plan to inject a $248 million boost over several years, into the devilment of this city-owned airport. The plan includes modernization which will expand the airport plus grow the retail options, security and parking areas. Millions of people travel through this airport each year, and delaying its much needed facelift is no longer an option. The improvements are urgent, as many of the country’s older, larger airports find themselves in fierce competition with a growing number of newer, regional hubs with modern facilities designed to create a much-improved consumer experience, helping to boost revenue. Midway is looking to improve its own financial situation with this huge investment from the city. It is one of only two US airports which posted a loss for operations in 2015, the other one the Bangor International Airport in Maine. The reported loss is in contrast to Midway’s place as one of 25 airports in the country with over 10 million airplane emplacements the same year as it reported a loss. Because the airport has no way to bring in the much-needed non-aeronautical revenue through the purchase of food, goods and services by consumers passing through the terminal, Midway is under huge financial pressure.